← What is Your Diary Style? Manic moves does not refer to my dance style but the fact that I am moving house in under a month. Previously I have found moving a hugely stressful time and to be completely honest, a terribly uncoordinated state of affairs. There is so much to remember to take care of, which has always been my downfall. There are those who must be contacted regarding your change of address for example, the gas and electric supplier, not just Aunt Maud so she can still send you a card every year. Then there are the details of the estate agent, the moving company, the solicitor and so on and so forth. You need to have quotes for the movers and other services done in order to save you paying over the top for something you desperately need and of course being disorganised when moving is almost certainly going to cost you money. So much to remember and so little time, which is why the Dodo Book of the Big Move is a wonder of organisation in amongst the chaos of bubble wrap and packing boxes. Previously I have left a lot of the work until the last minute however this time I am moving not only myself and my husband; I am also moving two small children, a business and a hamster called Yoda at the same time. A slapdash approach to moving just isn’t going to cut it on this occasion and I have to say that the ‘having everything written down or stored in one place’ is making life a lot easier. The Dodo Book of the Big Move has a section for everything. I can store to-do lists, financial details, quotes, company information, dates, reminders and more in this must-have mover manual. As always, the beauty of the Big Move book is that, as with all Dodo Pad items, I can doodle on it! Yay! I can scribble to-do lists and notes while on hold on the telephone (yet again) which provides me an enormous amount of creative satisfaction but also helps me channel my energies so I am less likely to bark at the thirteenth person to put me on hold during the call I’m on. In short, the Dodo Book of the Big Move gives me the opportunity to have all the information I need at my fingertips when I need it. It provides a simple and effective alternative to the reams of pieces of paper and easily lost post it notes and in addition to this, it’s completely portable – and it has an elastic bandeau around the outside to hold the ever increasing pile of papers in it falling out. It is clear to see why without the Big Move Book my hair would be even frizzier than it already is, and I would likely be pulling it out in frustration anyway. So thank you Lord Dodo for adding this gem to your collection. I am surprisingly calm and organised and feel in control of proceedings which is so rare when moving. With your help it appears that our move to our new home will be a relatively stress-free and seamless one. If you or a family member or friend are about to embark on a house move journey, now is the time to pick up a Dodo Book of the Big Move as it’s currently being offered at the reduced price of just £14.50. 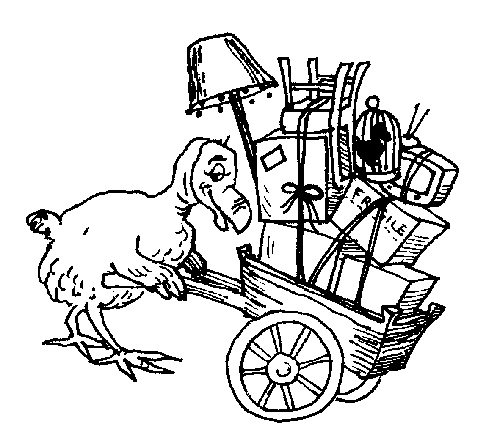 Lord Dodo’s small, but significant, effort to get the housing market moving again!